Back in 2005, the year in which I began writing Lines and Colors, I reported about an artist from Virginia named Duane Keiser, who had the year before begun a practice of painting a small painting every day, posting it to a blog titled “a painting a day” and placing it up for auction on eBay. It seemed a unique thing at the time, and as far as I can establish, Keiser was indeed the originator of the practice. In my article, I remarked on what a great idea this was, and how I wished I could emulate the discipline. It promised the kind of advancement as a painter that only regular painting can provide, aided by the incentive of selling the paintings as they were done. The following year, I reported on others who had become “painting a day” participants, like Karin Jurick, David R. Darrow, Shelly Grund, Elin Pendleton and, in particular, Julian Merrow-Smith. Over the years since then, I’ve watched and reported on the burgeoning of the “painting a day” phenomenon, although it has become so widespread and generalized that the term has lost much of its meaning, and I now tend to use the more general term “painter/bloggers”. This is a practice in which hundreds of artists, at all levels of experience, are painting and posting their work on blogs and connecting with buyers through online auctions, PayPal payments, Etsy shops, group sites like Daily Paintworks and other means of direct sales — either bypassing or supplementing the traditional gallery system. After following this for some time, and having gradually brought my own painting practice somewhat up to speed, I’ve decided to jump in and try it for myself. The regimen of painting every day remains appealing, and the idea of selling the work makes it more likely I will adhere to the practice and hopefully will allow me to devote more time to painting. What I’ve learned and decided so far. I’ve tried to observe some of the best practices from those who have been doing this for a while; and as I begin my process, I’ll try to make occasional reports on Lines and Colors for those who might be interested in what I learn. I’ve also tried to follow my own advice in my article on “How Not to Display Your Artwork on the Web” and the follow up series on “How to Display your Art on the Web“. So far I’ve established a few things that seem basic and essential, and I’ve also made a few decisions to vary from the mainstream. Like most painter/bloggers, I’ve created a blog, on which I will post my paintings as I put them up for auction. Unlike many, however, I’ve decided that on that blog I will only post paintings, and not water it down with posts about works in progress, studio photos, the new brushes I just got, the weather, or any other topics not directly related to the paintings. I will continue to insist that the home page of a website, or the top of a blog’s home page, should always be aimed at the first-time visitor, not those familiar with the site who are returning. For the design of the blog itself, I’ve deliberately chosen a dark neutral background, as I think it shows off the color of images to best advantage. Many painters without design experience don’t realize how much a colored web page background, that may seem appealing for the blog itself, can compete with and detract from the presentation of their work. I’ve made a point of dedicating the sidebar to introducing myself, and describing the intention of the site, the size, medium and support of the paintings, the process, and my policies for selling and shipping the paintings. I’ve also made sure to provide a contact email address. The current painting will appear at the top of the page, and visitors will have the ability to click on the image to view it large, or click on a link to view or leave comments. Comments will not only add interest for those visiting the site, but hopefully provided informative feedback on the paintings. 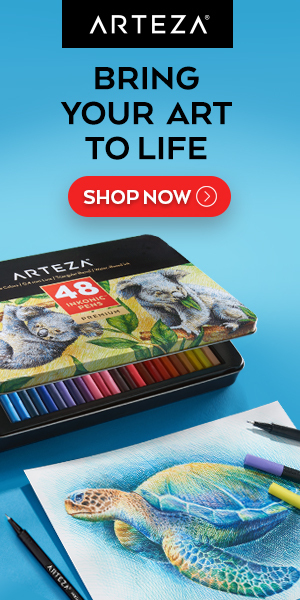 I’ve chosen to use eBay for the auctions, primarily because I already have an account and there is no upfront expense as with the Daily Paintworks auctions. Most of my paintings are 5×7″ or 6×8″, and in keeping with the kind of size-based scale I would apply to gallery pricing, I’ve decided to set their auction minimums at $100 and $125, respectively. On the blog, I’ve provided a consistent line below each painting on the entry to show the painting’s status: At Auction, Available or Sold, and a clear link to the auction. There will be an archive of past paintings, sold or otherwise, and a page for available works that are not at auction. Paintings not sold at auction will be priced at what I would consider gallery minimums at $200 for the 5×7″ and $250 for the 6×8″. Near the top of the blog, I’ve included a sign-up for a newsletter, by which those interested can receive an email notice whenever I post a new painting. For this, I’ve chosen to use MailChimp, which allows you to create and manage an email newsletter list for up to 2,000 subscribers and 12,000 emails per month for free. 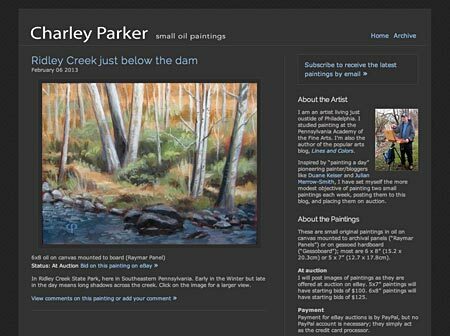 I’ve created a new email address, specifically for contact through the painting blog. I’ve created a new Twitter account, @CParkerArt, specifically for announcing paintings as I post them. I had to log out of my Lines and Colors Twitter account to create the new account. I’m using TweetDeck to manage multiple Twitter accounts now that they’re established. I’ve also given the blog some basic search engine optimization (more on that later) and I will probably leverage my ability to place an ad on my own general topic blog (i.e. this one) to perhaps send some visitors, and some “Google love”, to my new painting blog. One thing I’ve decided to do differently than most painter/bloggers is to delay posting the paintings for several weeks. Common practice is to post a painting as soon as it’s done, hot off the easel, so to speak. This, however, means that the purchaser, whether direct or through an auction process, must usually wait several weeks for an oil painting to dry enough to be shipped. At the risk of appearing out of sync with the seasons, particularly as they change, I’ve decided to wait three to four weeks for the paintings to dry, and then apply a light coat of retouch varnish — with another week for that to dry, before posting the paintings and putting them up for auction. This will allow me to ship the paintings as as soon as the auction closes. I’ve tried to weigh the the plusses and minuses of both approaches, but if I buy something, I’m much happier when I receive it sooner rather than later. My decision to varnish the paintings is as much a desire to even out the painting’s surface appearance as to provide protection. I seldom use medium when painting, so even though I’m using a very high quality paint (more on that later), passages in which I’ve used thinly applied chromatic blacks in particular (e.g. Alizarin plus Viridian or Ultramarine Blue plus Burnt Umber) can look flat or “sunken in” compared to more thickly applied areas of brighter color. After a bit of research, I’ve decided to use Gamblin’s Gamvar synthetic resin varnish, thinned with odorless mineral spirits (OMS to varnish 5:1), to act as a retouch varnish. This can be applied much sooner than a final varnish as it allows the paint to continue to dry. A light coating of this also has much less gloss than a full coat of final varnish. Unfortunately, I can’t say I’ve arrived at a completely satisfactory method of photographing the paintings. I’ll go into more detail on what I’m doing in that respect in a future post. I’ve been pretty consistent in recent weeks with painting every day and finishing two small painting each week. I’ve just posted my first painting (above, top), which was painted at a nearby state park several weeks ago (with a few finishing touches in the studio). I’ll try to occasionally report on my progress here, as I learn what works for me and what doesn’t. Of course, I’m always open to comments or suggestions from others who have engaged in the process. Very nice – your new web site is well-thought-out, well-done and appealing. The small painting shown is charming. Best of luck to you. Other readers can see Lisa Fulton’s painting blog, with her colorful interpretations of aerial views of highway interchanges (more interesting than it sounds), here. I think this is all great Charley. Best of luck with your progress. Thanks, Karin. I appreciate the vote of confidence. You’re one of the ones I’ve looked to for how to manage the process. Other readers can visit Karin Jurick’s painting blog, A Painting Today, as well as my most recent post on her work. Good luck with your new venture. I have been feeding the ebay machine life drawings and still lives on a daily basis for many years but don’t combine it with my blog. Have fun and don’t let it take over! This sounds like a great project – – I wish you the best of luck. Additionally, thanks for all of your efforts with Lines and Colors. when i read of artists doing this, it’s always exciting and inspiring!! very interesting how you’ve worked it all out…your painting & blog looks great!! one day, when both my girls are off to college i may jump in and join you…but with my drawings instead of paintings!! Though it’s more rare, some artists are doing this with drawings and other works on paper. How exciting! Best wishes for a very successful endeavor! I like the new site! Great post and good luck with the online selling. Thank you for sharing your ideas. Thanks for sharing this. I have been contemplating and researching a similar project for the past few years. My biggest obstacle are shipping and insurance costs, as I live in Europe and the majority of my buyers are from US. Anyway, I wish you good luck and I look forward to reading the updates. By the way, in my experience putting share buttons close to the image helps get more traffic, most of it from facebook. Awesome! I’ll be watching with interest. I’ve wanted for a long time to do something like a painting a day (I don’t think I could pull off daily either, but maybe, one day, twice a week for six months). I think it will be fascinating to see if your painting style changes or develops. Charley – I hope you get as much support in this endeavor as you have offered other artists over the years. Love this blog and look forward to checking out YOUR work! The new blog seems to be missing an RSS feed. RSS would be much more convenient than email. Thank you for giving all those great details on your thought process behind the hows and whys of selling your paintings online. I’ve enjoyed your blog for many yrs. and this is another excellent blog entry! Side note: Your kingofframes.com link on the right column is missing the “s” in the URL. Ignore my last comment about the kingofframe.com URL. It’s correct. Their site was just not connecting. Thanks, all, for the comments and pointers. Best of luck with this endeavor, Charley. Selfishly, I certainly hope this won’t diminish the time you give, tending this blog right here. It’s the best! Fantastic, wishing great you luck. I am sure you will have just as much success with it as you have had here with Lines and Colors. A little late with this but good luck Charley. I did something similar over the holidays only it was specific commissions. One, two, or three word catalyst paintings, since my work is image based, that were small and fast. It worked out really well and was fun. I don’t think I could keep it up for long though. I tend to go overboard on commissions. Charley, I have not been online for a couple days so I’m just discovering this. You have of course really thought it all out. I look forward to seeing its progress so I’m glad to see it from its inception, lines and colors blog I have yet to catch up on early posts! 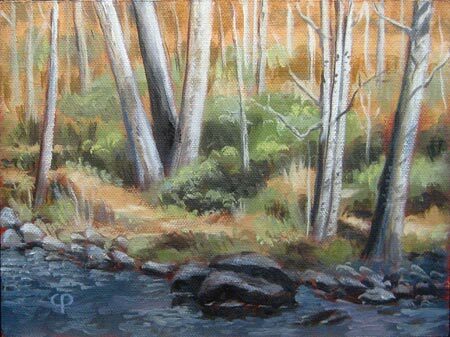 Are you going to do all of the paintings plein air, like the photo? Great work Charlie. I too have ventured into the plein air painter’s blog world. And like you I can only find the time for a few a week but I try to get them out there. One thing I have not done is try to sell them so I now have 150 or so 9 x12’s, 11×14’s and new 12″ squares. Your marketing ideas are much appreciated—now I just need to spend some time applying them. Thanks too for your great blog. Best of luck. Bill – Yes, keeping to it is both the challenge and, really, the reward — a regimen that promises steady improvement. I’ve seen some of the commissions you’ve posted to your blog – overboard to the point of being superb. Hopefully the buyers appreciate what terrific works they’re getting. I try to paint on location as much as I can, because I love it and I actually find it easier in many ways than working from photos, but I’m not a purist. I’ll also finish up paintings started en plein air in the studio, or work from photographs when I can’t work on location (I chicken out when it drops below 50 degrees and head for the comfy heated studio — Edward Redfield I’m not). I’m also doing still life in the studio. Ed – thanks. Though I’ve spent some money on my own blogging software and a webhosting account, it’s worth noting that most of this can be done without putting out money. You can sign up for a free blog on WordPress.com or Blogger.com, and the MailChimp newsletter list management is free for a basic account. I do think, however, that it’s worth getting a domain name and pointing it at your blog. I use NameCheap to register and manage domain names. Thanks, Duane! It means a lot coming from you. In addition to my admiration for your own paintings, I think you’ve fundamentally changed the way a significant number of artists approach their practice and communicate with those who buy their work. Charlie, I did not know you are an artist in your own right. And a very fine artist. 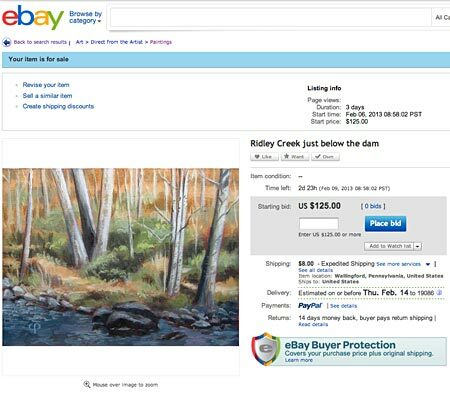 Your painting shown here at ebay is underpriced. Thanks, Robert! Hopefully, in the long run, the auctions will set the price. I’ve just set a minimum. Other readers can see Robert Tracy’s work here, and my posts on him here and here.